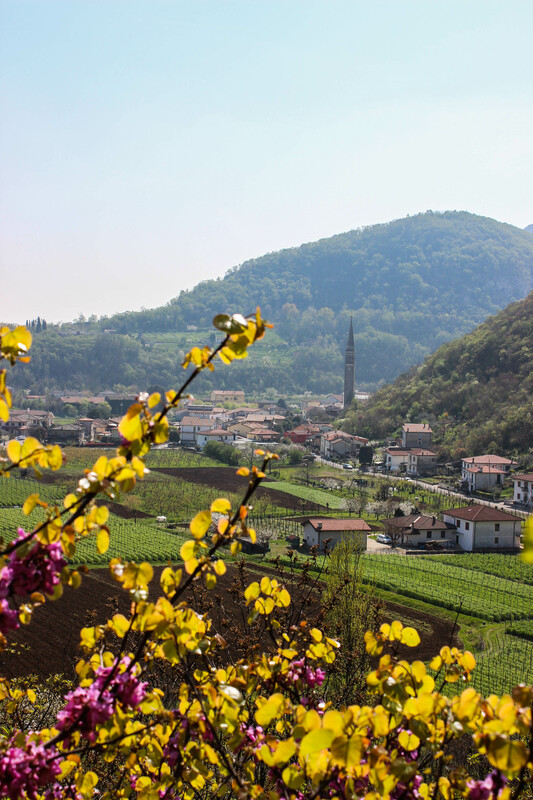 Over the weekend my friend Erin and I went on a day trip to the Emilia Romagna region of Italy, a few hours south of Vicenza. Alex was supposed to go, but ended up not being able to because of work, so Erin got to be my husband for the day. Emilia Romagna encompasses the well-known towns of Parma (ham, cheese), Modena (balsamic vinegar), Bologna (bolognese sauce), and Ferrara (Ferraris). As you can see, it is a region renowned for its cuisine, even in a country that is renowned for its cuisine. 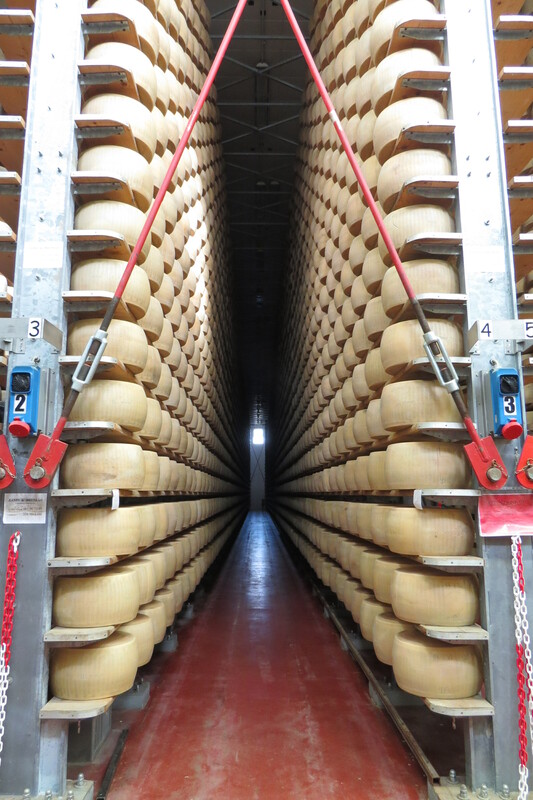 We started the day off with a visit to a cheese factory in Parma that produces true Parmigiano Reggiano cheese. The process starts with milk that was collected fresh the previous night and allowed to separate until the following morning. Around 5am, the cheesemakers get to work removing the cream from the top, which is used for other delicious products like butter (sorry, Erin). What’s left over is used to make the cheese. 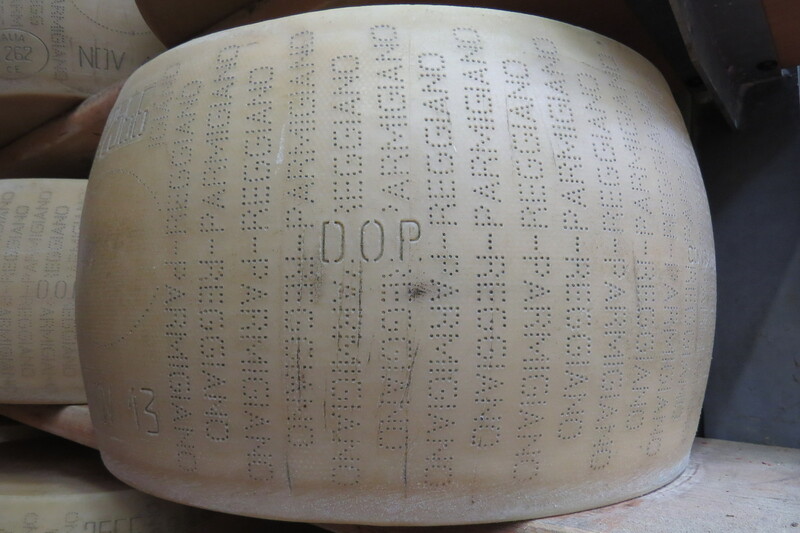 It is cooked in copper vats until the curds form, which are then removed and pressed into molds, which press the date and factory information into the rind of the cheese. These molds are placed on tables for a day or two to let all the water drain out. They have to be turned over several times a day to make sure the cheese forms evenly. After this, the cheese wheels are put into large vats of saltwater where they cure and absorb all that salty goodness for 15 days. <– After that, this is where you’ll find them. These cheese wheels (each weighing 40 kilos or 88 pounds) sit on shelves in a warehouse where they are left to age for at least a year. A few times within that year, professional cheese testers come to check the quality of the cheese. They do this by hitting the cheese wheels in various places with little metal hammers and listening to the sound it makes. Somehow, their trained ears can detect if the cheese is the same consistency all the way through, or if there are air pockets or softer spots. The highest quality wheels receive an EXPORT brand in the rind, showing that they are good enough to send to other countries. If a wheel does have air pockets or soft spots, it doesn’t mean it’s bad cheese. It only means that it has to be sold for a cheaper price. The age of the cheese also determines the price. The longer it’s aged, the more expensive it will be. 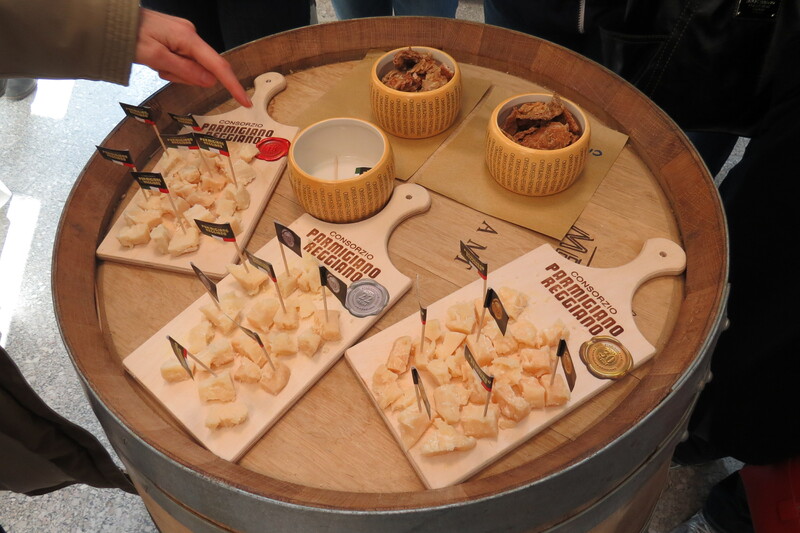 Afterward, we were able to sample the different ages of parmesan. 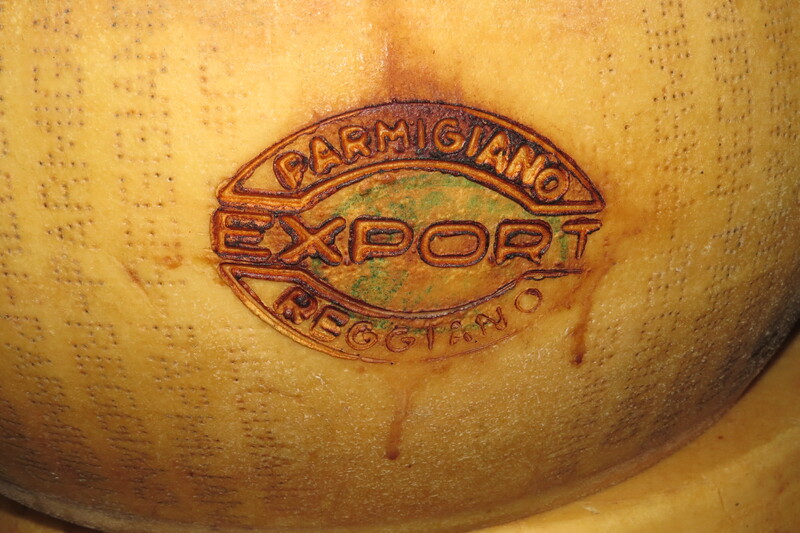 A red seal means the cheese is aged between 18 and 21 months. A silver seal is between 22 and 29 months. And the gold seal indicates a cheese has aged at least 30 months. I actually liked the 18-month cheese the best because it was a little sweeter than the others. Behind the counter they even had a special 70-month cheese for people with deep pockets. Erin and I don’t eat a ton of Parmesan (except when it’s served with little flags, apparently), so we each bought small packages of 12-month cheese to bring home. We plan to use them for classy wine-and-cheese nights. We learned that an unopened package of cheese will last 6 months or more in your refrigerator, so we have plenty of time to get our acts together and organize the aforementioned wine-and-cheese. 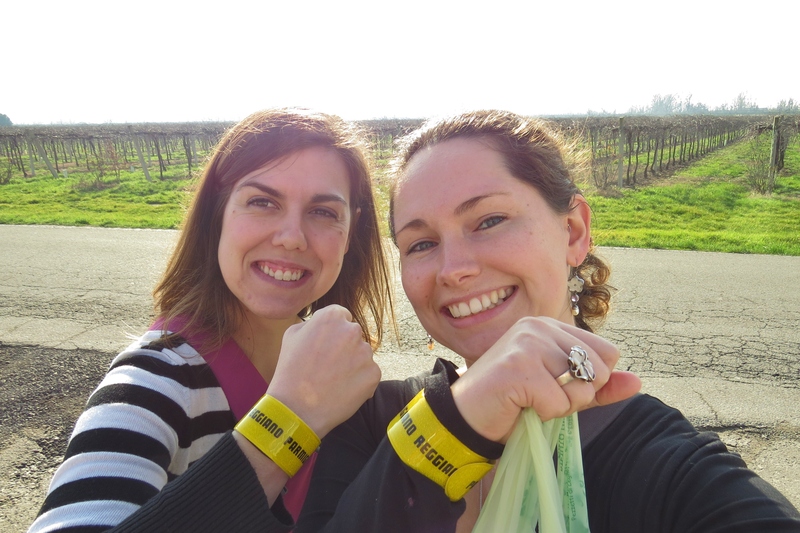 As we left the gift shop, we were all handed a little souvenir from the cheese factory. As much as I appreciate getting in touch with my inner 9-year old, I really wasn’t sure what the point of a slap bracelet was. Maybe we’ll give them to our husbands…. Make sure to check out Emilia Romagna Part 2: Traditional Balsamic Vinegar of Modena (my favorite part of the trip)! 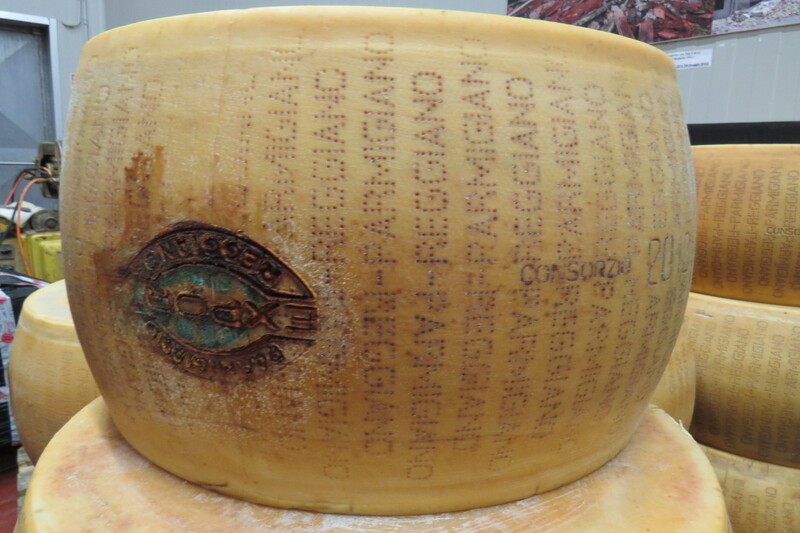 This entry was posted in Fooding, Italy, Travels and tagged cheese factory, Emilia Romagna, Italy, Parmesan cheese, Parmigiano Reggiano. Bookmark the permalink.